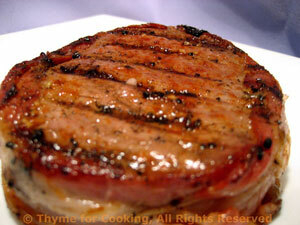 Thyme for Cooking Menus: Grilled Filet Mignon, easy recipes. These little filets are our end-of-summer treat. We don't often use butter but, sometimes, it's just the right flavor.... And I do love it! Small, thick-cut filet mignon are perfect done on the barbecue grill. A wrap of bacon adds flavor and helps the steak stay moist. That, plus a light sprinkle of seasoning is all these lovely steaks need. We like them medium rare. On a hot grill these will cook very fast - so be mindful! Wrap bacon around steaks and secure with toothpicks. Mix remaining ingredients and rub on both sides of steaks. Grill on barbecue over high heat 3 - 5 minutes a side. If you like rare, remove after two minutes per side, make a small slit in one and check. If not done to your liking return for another 1 - 2 minutes per side. Note: Could be broiled for roughly same amount of time - mind the bacon. Potatoes, lightly coated with oil and roasted on the barbecue grill to a golden brown; finished with some fresh Basil Butter: Perfect summer food! Mix butter, garlic and herbs, set aside. Slice potatoes in half the long way, then in half again. Then slice in half or thirds the short way. Put oil and paprika into bowl and mix. Add potatoes and stir, coating thoroughly. Put them into an old metal pie plate or cake tin or foil barbecue container (or whatever) that you will never use for any purpose but the barbecue again... and you should have one of these. Cook on barbecue (grill) for 30 - 35 minutes or until done... and you will need to stir them with a long-handled wooden spoon occasionally as they tend to develop 'hot spots' and can get a little crispy. Or you can roast them in the oven. Arrange potatoes on baking sheet with rim (I use my trusty, round pizza pan) Bake at 400F for 30 minutes. 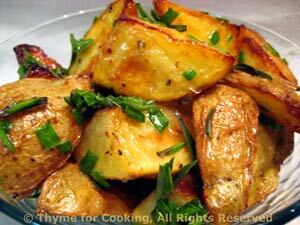 To finish: Put potatoes into a bowl, add basil butter and toss well, to melt butter and coat potatoes. Simple yet classic preparation, 'Amandine'. I like to work nuts into our meals: they have lots of nutrients unavailable in other foods. Plus, they taste good and add a bit of flair. Top and tail beans. Cut into 1 1/2" (4cm) lengths or leave long if small - nicer presentation. Put in small sauce pan or skillet with stock, put on medium heat and bring to a boil. Turn heat to low and simmer until done - about 10 minutes. Drain beans and put into a serving bowl. Heat butter and oil over medium heat in the same pan. 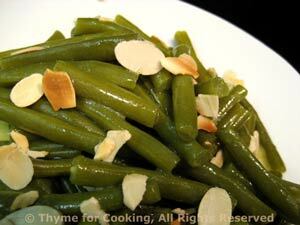 Add garlic and almonds and sauté for 3 minutes. Return beans to pan and toss to coat. Heat through and serve.